The first half of January was nice and quiet, but pretty soon Formula One kicked in to life in a big way. With the cars launching their intriguing nose designs plus the first unpredictable test week in Jerez, there's been a lot to discuss as the 2014 pre-season gets going in earnest. Just one show to catch up with this week, a quick chat with student Alex who asked me a few questions about the past, present and future of female racers in Formula One. The sixty second show was brought into Sidepodcast this month, more about that in the next section. Here's a round-up of the news that filtered through the Formula One world in January, including launch and test coverage, plus driver news and team movements. The big change on the site in January was the merging of F1Minute in to Sidepodcast. A variety of reasons were behind the move, but already it has breathed fresh life into the sixty second news show. There's still a lot to be done in terms of design and integration, but for now, F1Minute has a new home as part of the ever-expanding Sidepodcast site. You can catch up with all previous shows on the site, and stay tuned for new updates as the 2014 season continues to roll into life. You can also follow the dedicated Twitter feed to get updates directly episodes are posted. Talking of social network sites, Sidepodcast joined Pinterest just before Christmas, and we've been busy pinning all kinds of motorsport and site related things. From celebrating the retro designs on our old mugs, to the latest books on the Kindle, as well as our news in brief audio updates. If you're pinning things too, do join and friend and pin along! We've also discovered the joys of Flipboard recently, a way of sharing content in a new way - magazine style. 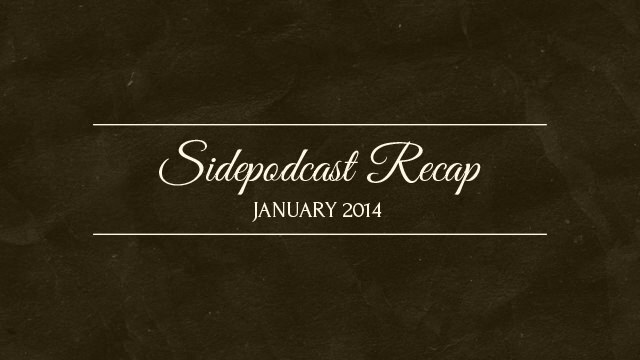 We've put together the latest and greatest Sidepodcast stuff in a dedicated board (or flip?) and keep on updating it so there is always fresh information to be flipped through! Back to the site itself, we tried out the logbook idea that was briefly introduced over the Brazilian Grand Prix weekend, this time covering each and every F1 launch. The teams didn't launch with much gusto this year, but we still managed to gather pictures, quotes, links and more in a rolling news style Factbyte Factbox. Hopefully we can do more of this as the season progresses. A bumper crop of posts as the off-season gave us all a bit of space to clear our heads and get writing. From breaking news to changing regulations, to plenty of statistical analysis of the season just gone. With two F1 seats remaining, who's in with a shot? We collected together some important bits and pieces on the Scrapbook this month, including the newest F1 drivers on Twitter, as well as the latest tweaks to the F1 regulations. F1 Big Picture's move to the Sidepodcast fold has encouraged a few more great photos to appear this month, they deserve their own mini list if only to celebrate the titles. Finally, it's worth a quick round-up of events. This month we've commented on NFL, Australian Open tennis, plus Rolex 24 at Daytona. There's even more to come in February, so stay tuned and join in!